AlSat-1B is an Algerian Medium-Resolution Earth Imaging Satellite built in a joint project by the Algerian Space Agency (ASAL) and Surrey Satellite Technology Ltd (SSTL). 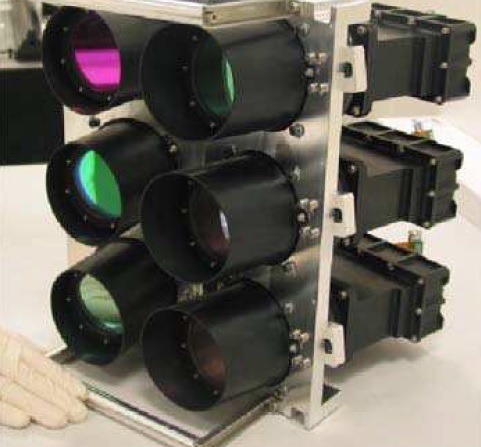 Built on a commercial satellite platform, AlSat-1B hosts a 22-meter multispectral and 12-meter panchromatic imager. The satellite was ordered in July 2014 and its development was accompanied by a comprehensive training program. 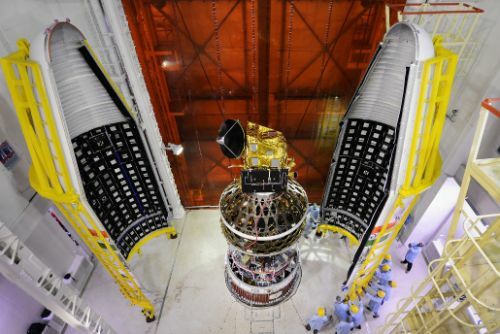 Assembly, Integration and Testing of the satellite was carried out by 18 ASAL engineers assisted by SSTL staff for the transfer of skills and the development of local capabilities. The satellite follows up on the AlSat-1A mission capable of 32-meter multispectral imaging as part of the Disaster Monitoring Constellation. 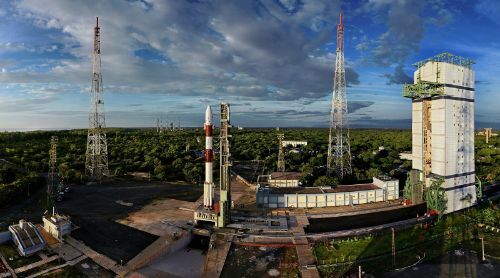 The satellite was launched in 2002 and operated beyond its expected life time supporting resource monitoring, fire detection, and global disaster monitoring. The 103-Kilogram AlSat-1B spacecraft is based on the SSTL-100 satellite platform suitable for light-weight Earth Observation payloads. SSTL-100 is advertised as a cost-effective platform for a wide range of LEO missions including single-bus and constellation missions. It can host payloads up to 15 Kilograms and has a five-year service life. 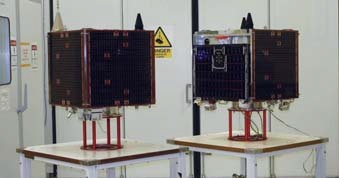 The SSTL-100 platform offers a main payload volume of 32 by 30 by 25 centimeters and a internal secondary volume of 18 by 22 by 4 centimeters. 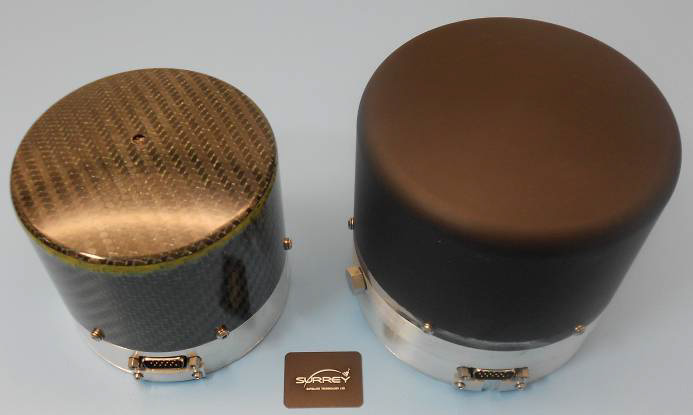 It consists of a stack of core avionics systems using a modular design supported by microtrays which add mechanical strength to the satellite and provide mounting structures for other satellite equipment. Internal panels are used to support the various subsystems of the satellite. Electrical power is provided by three body-mounted solar panels installed on three sides of the satellite for a total area of 1.08m² using single-junction solar cells and a 0.36m² deployable solar array hosting triple-junction cells with higher efficiency. Power is fed to a 15 Amp-hour Li-Ion battery using Battery Charge Regulators to manage the state of charge of the battery. Power from the battery is passed to the Power Conditioning Module and Power Distribution Module that supply an unregulated 28V power bus and a regulated 5V bus and distribute/switch power to all satellite subsystems. The satellite payload receives an average power of 24 Watts, though peak power demands of 48W can be satisfied by the satellite bus. The Attitude Determination and Control System of the Satellite uses a redundant set of sun sensors and magnetometers for coarse attitude knowledge and star tackers for high-precision three-axis orientation knowledge. Attitude actuation is accomplished by using 10SP-M reaction wheels. The reaction wheels are 109 millimeters in diameter and 101mm long with a mass of about 960 grams using integrated electronics that execute commands from the onboard computer. The reaction wheels spin at up to 5000rpm to deliver an angular momentum of 0.42Nms and a peak torque of 0.011Nm. Momentum management is provided by 25-centimeter long magnetic torquers. 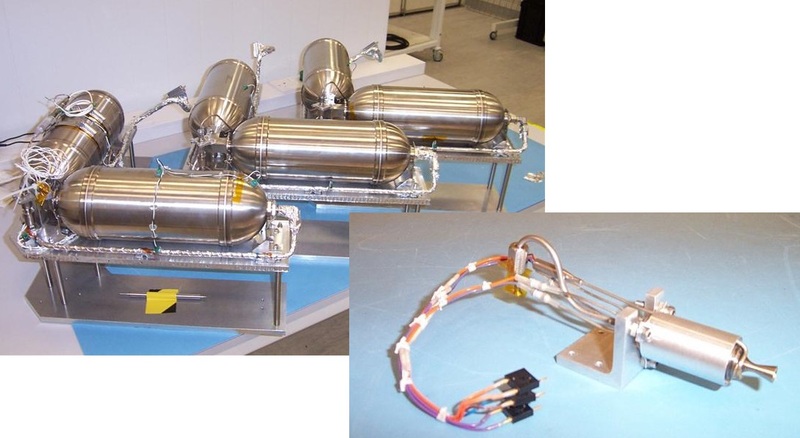 The satellite uses a Butane Propulsion System, a high-performance alternative for low earth orbit missions. It is comprised of a pair of propellant tanks feeding a single resistojet thruster via a series of propellant flow and isolation control valves. The system is a warm gas system, heating up a resistojet thruster to increase the specific impulse of the propellant over that obtained when used in a cold gas engine. The propulsion system is 44 by 44 by 14 centimeters in size and weighs 8 Kilograms, including a 2.35-Kilogram supply of Butane. 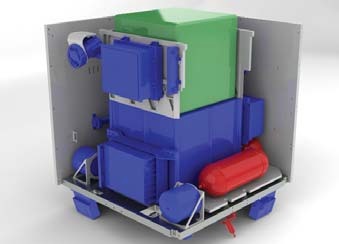 The resistojet thruster is heated by two 15-Watt heaters, requiring ten minutes of pre-heating, delivering a nominal thrust of 50 Millinewtons and a specific impulse over 80 seconds. 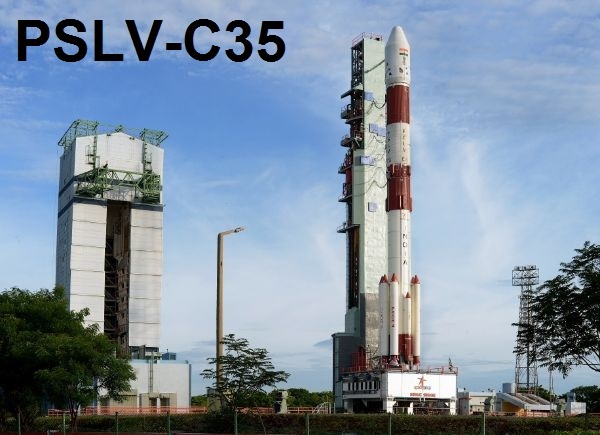 The overall delta-v budget of SSTL-100 is 20 meters per second, allowing for launch vehicle error correction and several years of orbit maintenance. The Onboard Computer system is in charge of receiving and processing commands from Earth and controlling all satellite subsystems. The system also receives all payload data that is stored and conditioned for downlink by the OBC. Payload data is stored in a 16GB High-Speed Data Recorder that supports 20 LVDS inputs/outputs at a data rate of 150Mbps, 5 SerDes inputs at up to 2Gbps and 16 LVDS outputs at 150Mbps. The system is 32 by 17 by 5.5 centimeters in dimensions at a mass of 1 Kilogram. Payload data is dowlinked via an X-Band terminal achieving a nominal data rate of 80Mbps while telecommand uplink and telemetry downlink uses an S-Band system. 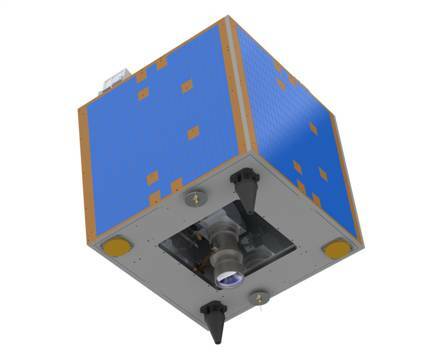 The primary payload of AlSat-1B is the DMC Multispectral Imager (MSI) baselined for use on the SSTL-100-based satellites in the Disaster Monitoring Constellation (DMC) that has been in continuous operation for over a decade. The MSI flown on this mission represents an advanced version of the original imaging system, improving ground resolution from 32 to 22 meters. The wide-swath MSI consists of six separate imagers arranged in two banks of three sensors. Each bank is installed at an angle to each other so they can image adjacent parts of the ground scene with a 500-pixel overlap between the two. Each channel has a field of view of 26 degrees and the telescopic imagers have a 15.6-centimeter focal length. 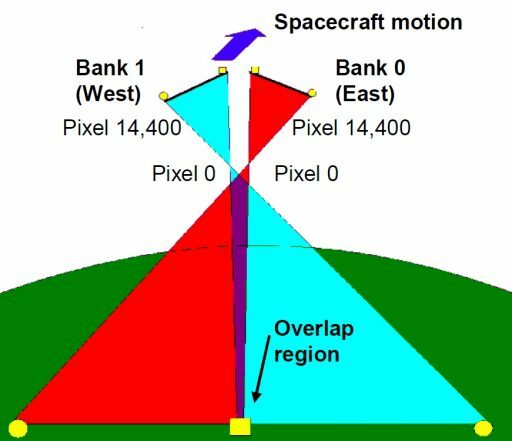 Opposite sensor pairs each host a 14,400-pixel linear CCD sensor and identical passband filter – creating an effective image width of 28,300 pixels corresponding to a ground swath width of 660 Kilometers. The three wavelength channels supported by the instrument are identical to three of the Landsat passbands to ensure data compatibility. MSI covers a green (523-605nm), red (629-690nm) and near infrared (774-900nm) channel. MSI measures 31 by 26 by 24 centimeters in size and weighs 12 Kilograms, requiring a power supply of 24 Watts.